You are here » frostvalley.org » Overnight Camp » Camp Wawayanda » Pokey Totem Pac Windsong CIT Challenge Night! Pokey Totem Pac Windsong CIT Challenge Night! Tonight the stars aligned for a perfect evening activity. The location: the hard courts. The players: Pokey Totem, Pac, Windsong, and Counselors in Training. The eaters of ice cream: everyone! Some of the challenges included smelliest shoe, silliest laugh, and best Frost Valley person impersonation. There was also a new challenge, where an older camper must blow up and tie a balloon and pass it to a Pokey Totem camper. The Pokey Totem camper must then sit on the balloon and pop it. Then the older camper can begin blowing up the second balloon and doing the same thing. The winners completed the challenge in a record 24 seconds! Pictured above is the limbo challenge. It was amazing to see the campers make it through seemingly impossible rounds! I had the pleasure and honor of serving as one of the judges, and it was a hoot! 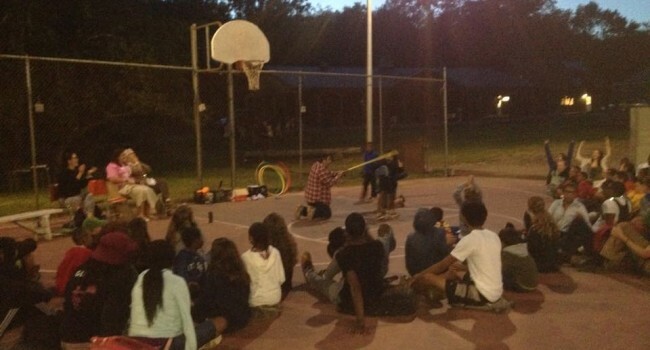 The CITs and Pac Windsong campers really enjoyed getting involved with the younger campers and helping them participate. At the end Al provided ice cream for everyone. It was a wonderful night!